For years, I’d been hearing wonderful things about Ken Follett’s The Pillars of the Earth, but at almost 1000 pages, its size intimidated me. 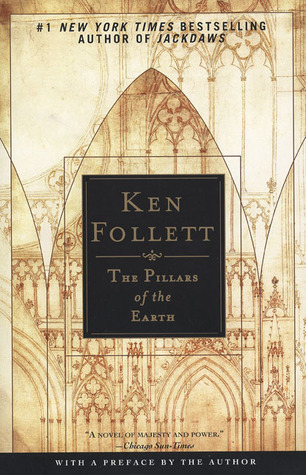 I was a long-time fan of Follett’s thrillers, but reading such a long book about the building of a cathedral just didn’t grab me. All those great reviews were right, though, and I was wrong. I finally took the hefty tome off the bookshelf this summer, and I loved every page. Summaries of this novel often describe it as being about cathedral building, but that’s such a limited, narrow view. The Pillars of the Earth is an epic, covering several generations of people, set in twelfth-century England. Although it is historical fiction, it reads very much like Follett’s earlier thrillers, filled with tension, conflict, and a classic struggle between good and evil. There is something here for everyone, from battle scenes between knights to fascinating historical events to tender romance and architectural details. Tom Builder is a talented mason looking for work so that he can feed his family (I loved hearing how people were named after their vocations – one of many fascinating details about the era that Follett brings alive). Philip is a kindhearted and devout monk whose lifetime goal is to reform the Priory of Kingsbridge and build a new cathedral there. Lady Aliena is the beautiful young daughter of a powerful earl whose life is about to change dramatically. The story begins there, with three separate people – and their families and friends – whose lives and fortunes will eventually intersect. It moves through the intricacies of history, among battles and rebellions, changes in leadership, and the whims of those in charge. Meanwhile, those larger events affect each of the characters in the story differently, and the reader is brought along through their personal tragedies and joys, all framed within the captivating details of their daily lives. This is one of those novels where you come to care about the characters (most of them; others you come to hate), where you are cheering them on and hoping things will finally go their way. As in his previous novels, Follett doesn’t shy away from hard truths; this was a brutal time in history, and there are some horrible and disturbing acts of violence in the novel (and not all occur during battle), but that only makes you root for the main characters even harder. I even found the scenes describing the cathedrals and building process interesting, much to my surprise. Despite its length, the book never dragged for me. Follett writes with his usual talent for pulling the reader in and moving the story along at a fast pace. Yes, I just described an almost-1000 page novel as fast-paced! Don’t be afraid of the size of the book – just dive in and enjoy the ride. I didn’t want it to end, even after reading it for three weeks. Now, I can’t wait to watch the DVDs of the TV mini-series adapted from the book – I can’t seem to get enough! Hi Sue! This is one of my favorite books. I liked everything about it and you're right that it was a fast read. I read it a few years ago (even before Oprah, lol) after my older daughter called to tell me about it. I still haven't watched the mini-series. Need to do that soon. I have this but have never gotten into it. Everyone does seem to love it so I need to try it. It's Monday 9/26! What Are You Reading? It's Monday 9/19! What Are You Reading? It's Monday 9/12! What Are You Reading? It's Monday 9/5! What Are You Reading?